Honours Shared for Jim Blurton’s Trio! 2009 has started with all three of Jim Blurton’s apprentices successfully passing their final exams. Ricky Hilton, William Grattan and Simen Krog all qualified as fully fledged Farriers at Myerscough College last week. For all three it was a superb culmination of dedication, hard work, long hours in the forge and constant scrutiny from their ATF, the world renowned Jim Blurton. William came to Jim Blurton’s farrier practice in 2004 and instantly became an invaluable member of the team. With a background in engineering there seemed little Will could not turn his hand too, including some landscape gardening! 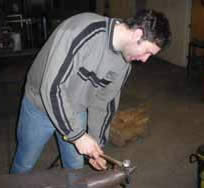 He not only developed his skills as a farrier with Jim, but also taught many of the team the best ways to weld, tool maintenance and solve any mechanical or technical problems within the forge. Will has represented Ireland as an apprentice and has been successful in many competitions whilst at Forden Farriers. Mild mannered and softly spoken Will is without doubt one of the best farriers to qualify under Jim’s tutelage. Simen came over from Norway in 2008 as an established Farrier in his home country. He had spent some time on an exchange visit in America before seeking an apprenticeship with Jim to improve his skills. Whilst with Jim, Simen has improved significantly in all aspects of farriery. This was recognised by his fellow countrymen when he was included in the Norway National team for the World Team Shoeing Championships last year. He is set to return to home to establish his own practice and cement his reputation as the best Farrier in Norway. Ricky came to Jim in 2004 with only one thing on his mind, to learn from and be the best! He has toiled relentlessly for the last 4 years and under Jim’s careful watch has established himself as the best apprentice in the country. He has won every competition on the circuit which culminated with him taking Gold in the European Championships last year. Ricky's unique talent has been nurtured by Jim and his confidence in his own ability is such that he will showcase his skills on the world stage at Calgary later this year. With his singled minded attitude towards farriery and success who would bet against him following in his mentors footsteps and return with the World Championship Crown!